The future of collecting is bright! We now have a myriad of new digital opportunities and experiences now available to us, and thanks to the forward planning of the ECOMI team we can incorporate them into the world of non-fungibles and digital collectibles. So let’s break down exactly how ECOMI Collect will incorporate augmented reality to bring your collectibles to life! ECOMI Collect is a digital collectibles platform, bringing some of the worlds biggest brands and licenses into the new digital era, and allowing you to own your own digital-only versions of your favorite characters and series. Purchases will be made in-app, after which you own the collectible, and can use them for in-app gaming experiences, sell them on our second hand (peer-to-peer) marketplace, change appearances, scenes, and a whole host more! As its name suggests, augmented reality ‘augments’ our reality. Typically augmented reality (AR) superimposes computer-generated images/graphics over your current view of the real world, forming a composite image and allowing for a whole host of new visual information to be presented, in real time. Couple this with the development of wearable AR glasses and AR has the potential to truly revolutionise our daily interactions with technology. The most prolific example of AR in entertainment/gaming was rolled out with the launch of Pokemon Go- a smartphone app which took in the users surroundings and superimposed characters over them. This composite view (displaying the real world surroundings and the game's characters) allowed users to interact with their smartphones in a way that had not been seen on as this grand scale. Both Samsung and Apple phones now come standard with AR capabilities, allowing for the development of new experiences on ECOMI Collect. Using distributed ledger technologies, we can now create, distribute and own digital files/assets. In the case of digital collectibles, these ‘files’ are distributed as non-fungible tokens (NFT’s). The movement of these files, including their ownership and sale, are tracked on an immutable ledger (for ECOMI this is on the GoChain network) and also allows us to incorporate rich metadata into the asset itself. When viewing an ECOMI Collect digital collectible in AR, the digital collectible is like a real-world object — the user can move around it and view it from all angles, in both 2D and 3D (depending on the collectible itself). Using the AR, collectibles will adapt to their real-world surroundings, turning ordinary surfaces into amazing interactive environments. 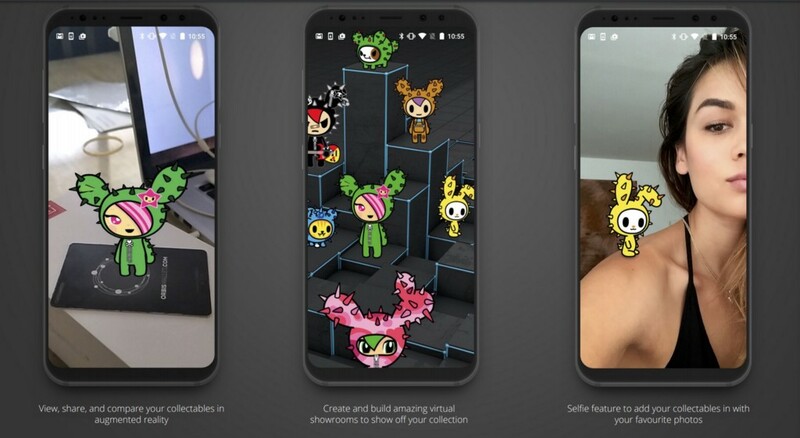 Moreover, users can customise their collectibles and decorate the surrounding area with props and accessories, then view (and share) these creations in AR. The AR experiences and in-app gaming will continue to develop with existing AR technology until we get to a point of affordable and functional, wearable AR glasses, after which the capabilities are endless! ‘Like’ and leave comments on other people’s showrooms, and even leave them a tip using the OMI token to show your appreciation! ECOMI Collect allows users to get creative and build their own unique Scenes which consist of digital collectibles, props, accessories and background images to create visually rich 3D environments. By providing an easy-to-use 3D visual editor, the app allows users to drop items into the 3D Scene and using a range of tools, move, rotate or scale items. The user can also adjust the scene lighting and the camera view to capture the perfect frame, and to share your collection on socials! Scenes can also be viewed and experienced by other users thanks to the ECOMI Collect AR capabilities. Virtual Goods are available both free and purchased (with OMIs or fiat) and accessed from the Virtual Goods section of the Store and within the Scene Creator. Licensed content, that is paired with specific digital collectibles or brands. All virtual goods are also non-fungible tokens minted by ECOMI and, similar to the collectibles themselves, will be released in both high quantities and scarce, limited numbers. Assets in the Virtual Goods Store will be provided initially by ECOMI and partners. In future releases, ECOMI aims to allow user-generated content to be contributed and sold within the Virtual Goods Store as well. 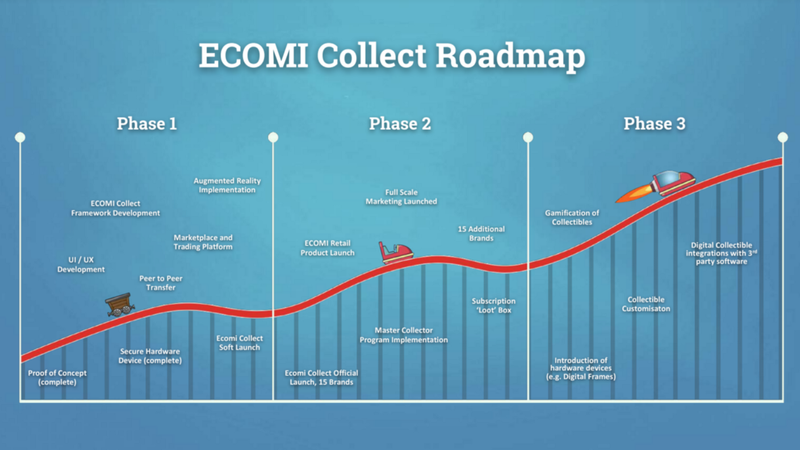 Scheduled to launch in phase 3 of ECOMI Collect (Q4 2019), our in-app gamification allows users to interact and play with the digital collectibles they own, creating a further level of engagement. A range of single and multiplayer game experiences can be played within ECOMI Collect using the Augmented Reality features. More details will be released on these experiences in due time, however, we can release that you will be able to gain access to specific game experiences based on the collectibles you own. For example, owning a Street Fighter digital collectible will grant access to play a multiplayer Street Fighter AR game, which can be played against other ECOMI Collect users who also own Street Fighter digital collectibles. Playing ECOMI Collect games also offers the chance to earn OMI tokens, experience points (Master Collector) and find ranges of common to secret-rare digital collectibles and virtual goods. It’s safe to say there are very exciting times coming for ECOMI and the worlds best, premium and licensed digital collectibles platform. For more information about ECOMI Collect please see the ECOMI Collect whitepaper, or visit ecomicollect.com. Augmenting Reality with ECOMI Collect! was originally published in ECOMI on Medium, where people are continuing the conversation by highlighting and responding to this story.